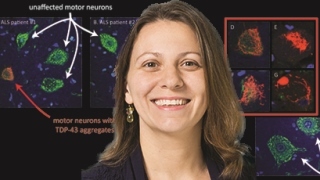 Prof. Magdalini Polymenidou has been elected as EMBO Young Investigator. She joins a network of some of the best upcoming group leaders in the life sciences in Europe and beyond. Through the Young Investigator Program, EMBO identifies and supports some of the best young researchers in the life sciences. Election to the program means recognition of exceptional research and scientific potential. EMBO Young Investigators are group leaders in the early stages of setting up an independent laboratory in European Molecular Biology Conference (EMBC) Member or Associate Member States. They receive financial and practical support for a period of three years to help them develop skills and connections that will help them during this career stage. The Young Investigator Program was started in 2000. EMBO Young Investigators are selected annually and the 47 current members, together with 417 former members of the program and the recipients of EMBO Installation Grants, form a network of Europe’s next generation of leading life scientists.